What does it take to create content that grabs and holds the attention of a target audience amidst an inundation of online information? It’s a question content marketers must ask again and again. And few answers to that question inspire as much trust as those provided by Ann Handley. 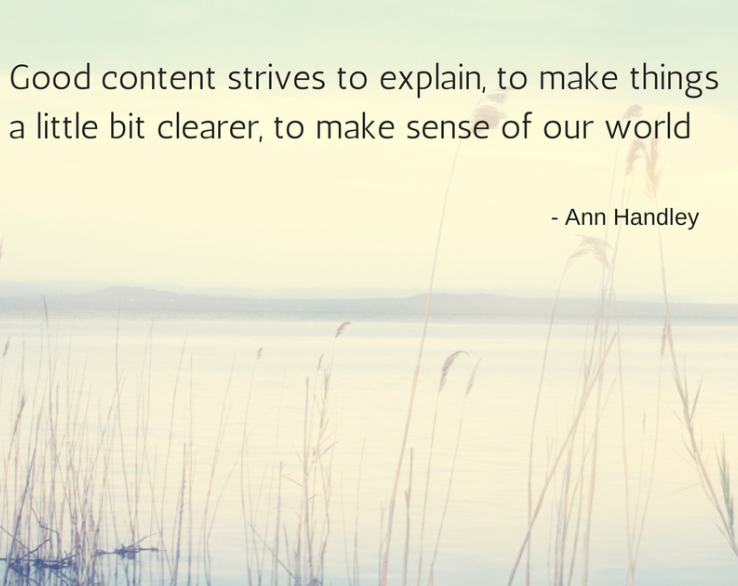 The author of Content Rules and the soon to be published Everybody Writes: Your Go-To Guide to Creating Ridiculously Good Content, Ann Handley is mentioned often by members of the #ContentChat community on Twitter as someone they admire and learn from on the topic of content marketing. And it’s no wonder. As the world’s first Chief Content Officer, and director of all content at MarketingProfs, a training and education company with the largest community of marketers in its category, Ann’s tweets, blog posts and presentations are eagerly watched, discussed and shared by content marketers the world over. So we were thrilled when she agreed to discuss the topic “Creating Ridiculously Good Content” this week with the #ContentChat community on Twitter. As you can imagine, the chat was well-attended, drawing 84 contributors. Next story How Do Digital Marketers Use Twitter?